Remember how I said I expected it to be a long battle to get compensated from Megabus? Well, it actually went pretty smoothly. In fact, my money is so close I can taste it. I was given a final settlement offer from the claims company and it was an adequate amount — “just sign the release in the presence of a notary and we’ll get your check in the mail” they said. …And that’s when things stopped going so smoothly. Do you know how easy it is to get something notarized in the US? You just go to your local bank. My own brother is a notary public. The last time I needed something notarized I think my high school math teacher did it. Do you know how easy it is to get something notarized in the UK? Not very. Like almost everything else in London, it’s expensive and time-consuming. I immediately started googling notary publics in London. I made an appointment with the US Embassy notary, but the earliest they had was Feb. 5. I found a guy who was a licensed lawyer and notary in both the US and UK, but he wanted £80 ($132) to witness my signature on a one-page document. So I started calling around, asking for price quotes — I heard everything from £75 ($125) to £95 ($157) — for yes, a signature and stamp. Three minutes of time. For what you could get at your local bank for free or a fiver in the US. I called one notary who was willing to bargain. “I charge £75, but if you find a better rate I’ll match it,” he said. “The US embassy charges $50, which is £30,” I told him. He paused. “You should just go there,” he said. I managed to secure an emergency notary appointment with the embassy for today, because I could tell the claims people were getting antsy to get this thing settled (as am I). I’m not sure a Megabus fire settlement release constitutes an “emergency,” but I’ll take it. My appointment was at 9:15 a.m,. so naturally I arrived at 8:30 a.m. because I managed to catch the early bus and there was little traffic. But I needed a little extra time because getting into the US embassy is tougher than getting on a flight. They do not allow any electronics — no iPhones or Kindles — or even car or apartment key fobs. They will not even store them for you, they worked out a sweet deal with Gould Pharmacy up the street where you can securely store your belongings for £3. That little place has got to be making a killing on iPhone storage. So I put my phone, headphones, FitBit and keys in a bag and walked back to the embassy. There was a huge queue out front for visas, but I got to go to the other side for American Citizen Services. They let me in even though I was early and I managed to get the first number for notary services. I sat in the waiting room reading an article about panda breeding in an outdated “New Yorker” and browsed through the official “American in Britain” magazine, which is what you have to do when they take your Kindle app away from you. Eventually I was called to the window, presented my document, then was told to pay first. At least I was able to use my US credit card and pay in dollars. Then I had to wait again to sign my document. The consul notary was very nice and asked me what part of Ohio I was born in after looking at my passport. Then he said he was from Cincinnati. Of course I would go all the way to London to get a notary from Cincinnati. We swapped Megabus stories before getting down to business. I then had to awkwardly ask a random guy in the waiting room to sign the release as my witness. He obliged, I got the official embassy seal and signature, and I was on my way. “Hope you get your money from Megabus!” the notary said. 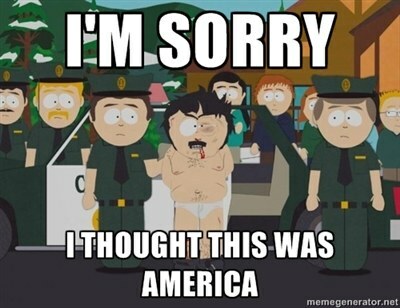 I had to wake up early, travel to my country’s embassy in the rain, and pay $50, but I got my notary signature. Megabus monies, come to me! My clothes aren’t that clean and are still damp despite being in dryer mode for 2 1/2 hours, but hey, at least I have one less appliance in my flat, right? Since I used the word “flat” and am complaining about laundry, you are safe to assume I made it back to London in one piece (and with all my luggage! Which was inspected by the TSA twice, since apparently not that many people travel with jars of Peanut Butter & Co. and a julienne vegetable peeler.) I am now deep in the struggles of remembering what my daily life is like when I’m not struggling to fall asleep and then forcing myself to wake up. I remember I used to love grocery shopping and did a lot of laundry, so that’s what I did today, and I should probably get some work done, but these sheets … so warm and clean! 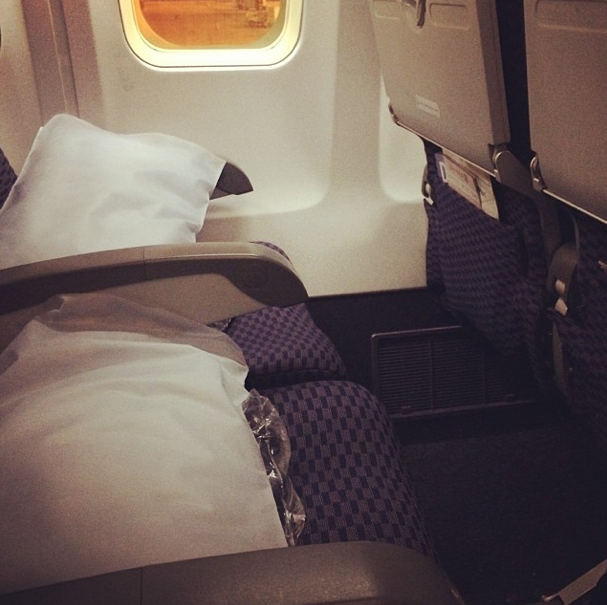 I always say I can’t sleep on planes, but what I really can’t do is sleep sitting up (I originally typed that “sit sleeping up.” Yeah… can you tell I need to sleep up soon?) I purposely chose this row of empty seats and then obsessively tracked the seat map on the United app to make sure nobody booked a seat in my row at the last minute. The downside of flying during the winter is the high chance of mechanical problems or weather cancellations, but at least the planes from the US to London are rarely full. On Friday night I logged 9 1/2 hours of sleep, and thought I was back on track. 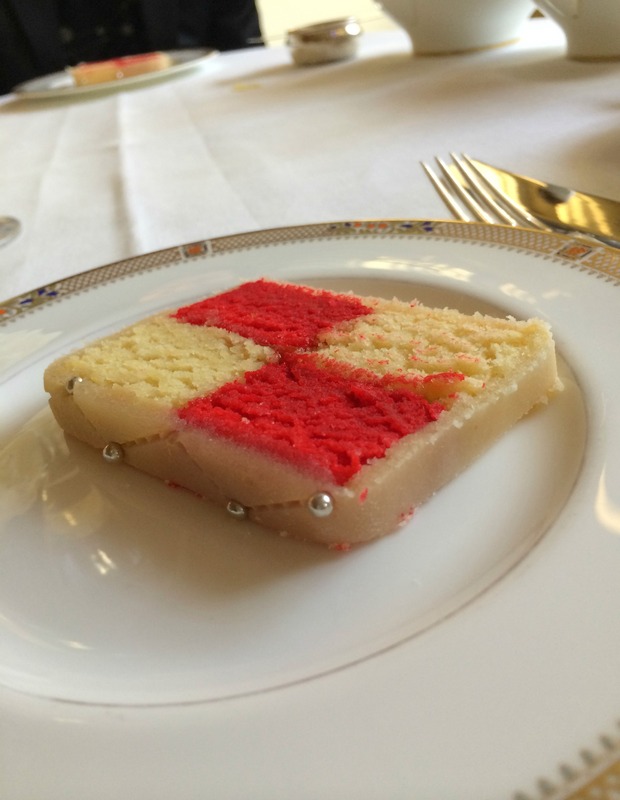 But then Stephen and I went to afternoon tea at The Dorchester to celebrate our anniversary. 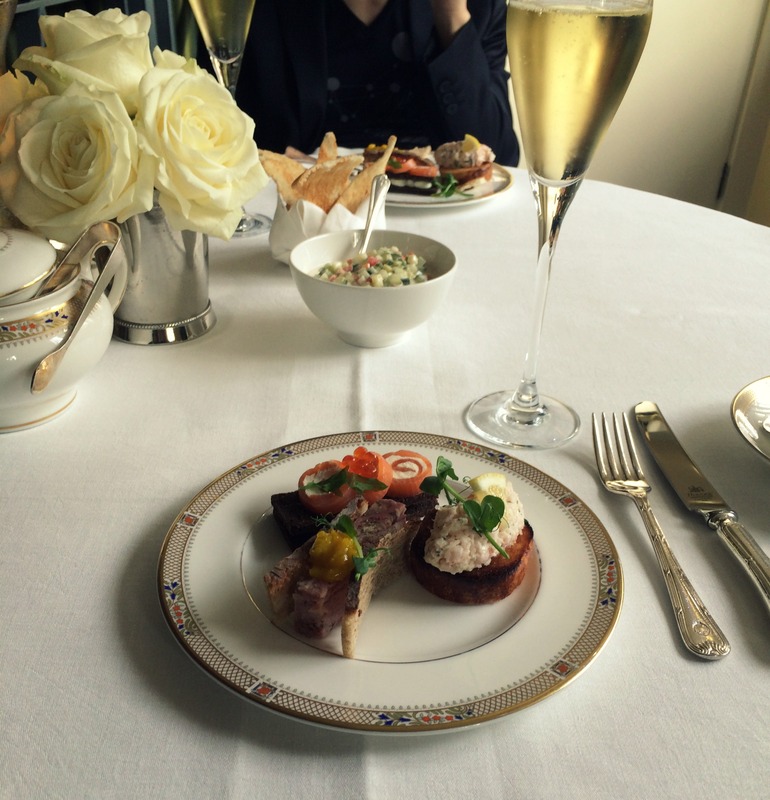 It was lovely — the food, champagne and tea… lots and lots of tea, which it turns out doesn’t go well with jet lag. According to my FitBit, I was “restless” for an hour and a half before finally falling asleep on Saturday night. No more guzzling nearly two pots of tea for me. I’ll end with a couple photos I took at the afternoon tea before I start talking too much about sleep, laundry and grocery shopping — or, my luxurious London life! Four hours ago I was on a plane pulling away from gate A13 at the Cincinnati-Northern Kentucky airport, headed to DC before connecting to London. I had my new headphones on playing the perfect takeoff song (since small electronics are allowed during takeoff now, thanks Obama!). I was ready. I had said goodbye to my parents and Squirt at the airport, put my just-under-50 pounds bag on the scale, and made it through security. And yet now I am in my childhood bedroom in Kentucky, lying on the sheets I had to fish out of the laundry bin because I was supposed to be halfway across the Atlantic now. And all I can think is “Well, at least nothing blew up,” because that is my new standard — buses run late, planes get delayed or have error messages right as the pilot begins to take off, forcing you to return to the gate and miss your international connection, but as long as no one gets hurt and nothing catches fire, it’s OK. Things could be worse. 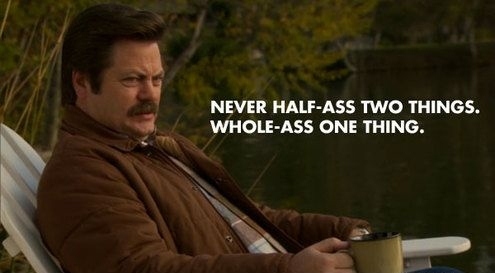 I have adopted this mindset thanks to the events that went down nearly a week ago. I boarded a Megabus — what was once my favorite mode of transportation — to Chicago, where I was to have a splendid weekend with friends and a reunion with my former college roommates. While it was still a relatively splendid visit, what time I was not spending with friends I spent shopping for things like underwear and deodorant because I arrived in Chicago five hours late (after leaving on time) with nothing but the pug sweatshirt I was wearing. Because my bus caught on fire and all of our luggage was destroyed. I’m still amazed by how calmly I — and everyone, really — handled the situation. Things could always be worse, but this was a pretty bad situation and I didn’t break down. I got on another bus to Chicago without really thinking about it. In the news footage I’m smiling brightly. Maybe it was because I had nothing else to lose. The long battle to replace my belongings and receive compensation from Megabus has begun, and I’m sure it will be a long battle, but I’m thankful that no one was hurt. I love my things — probably more than the average person likes a pair of pajama bottoms or an umbrella — but it’s only when you see giant flames shooting out of a bus that you were on just minutes ago that you can truly say things can be replaced, life is what’s important. Maybe there was a reason my plane had an error taking off this evening, maybe there wasn’t. I can only hope I can get to London safely tomorrow. A delay I can handle, but I think I’ve reached my limit on losing precious belongings this month. I’m not superstitious, but if I have one more traveling problem it’ll be hard not to think I’m wearing my unlucky travel pants or I somehow upset some karmic balance. 2014 can only get better. Well, it’s 2014. I spent the morning gorging on unlimited soup, salad and breadsticks at Olive Garden, then ran 5 miles in the afternoon. It may have been my longest run since the 10K (6 miles) on Thanksgiving. It felt great though, thanks to all the lovely running-related Christmas gifts I received this year from friends and family — a GPS watch, a handy water bottle, running tops, wool moisture-wicking socks and my new iPhone. Everyone always makes reflective What Happened in 2013 posts and I was about to say not much happened for me, but that wouldn’t exactly be true. I had a lot of people come visit — three different friends and my parents. It also seemed like I didn’t travel much, mostly because it was the first year in a while I didn’t make it to China, but I did manage to visit Paris, Salzburg, Munich, Fussen, Brussels, Bruges, Athens, Amsterdam, Haarlem, Chicago and Milwaukee. That’s quite a few passport stamps. Most importantly, though, 2013 was the year I got into running. I started with a simple goal — finish the couch to 5K program — and then six months later I completed my first 10K. I started simply to “get fit” and because my pants were getting tighter after one too many beers and pretzels in Germany. I never expected to get the sense of accomplishment and mood elevation that now come with every run. I’m not going to say 2014 will be the year I conquer a half marathon — 13.1 miles still seems terrifying to me — but I definitely intend to keep moving in 2014 and pushing myself harder. 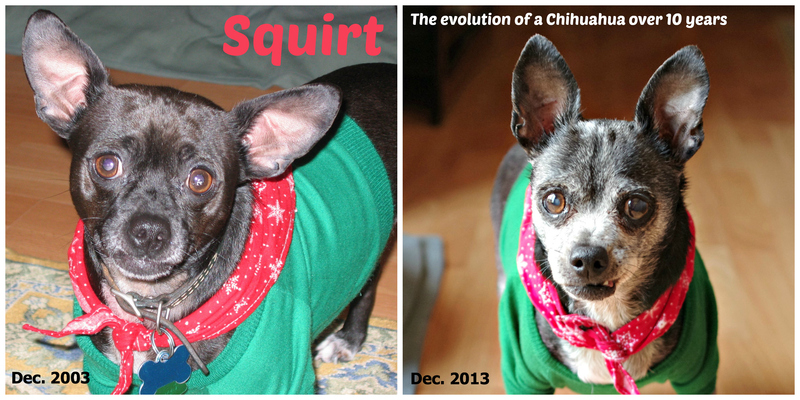 I’ll close with comparison photos of Squirt I recently put together. The old man was not cooperating with my photo shoot so I couldn’t get him in the exact same pose, but you can still see how much he’s aged over 10 years! He was 4 1/2 on the left, now he’s 14 1/2.